A hand x-ray is taken in a hospital radiology department or your health care provider's office by an x-ray technician. You will be asked to place your hand on the x-ray table, and keep it very still as the picture is being taken. You may need to change the position of your hand, so more images can be taken. Tell the provider if you are pregnant or think you may be pregnant. Remove all jewelry from your hand and wrist. Generally, there is little or no discomfort associated with x-rays. 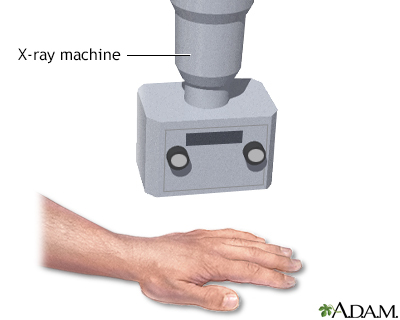 Hand x-ray is used to detect fractures, tumors, foreign objects, or degenerative conditions of the hand. Hand x-rays may also be done to find out a child's "bone age." This can help determine if a health problem is preventing the child from growing properly or how much growth is left. There is low radiation exposure. X-rays are monitored and regulated to provide the minimum amount of radiation exposure needed to produce the image. Most experts feel that the risk is low compared with the benefits. Pregnant women and children are more sensitive to the risks of x-rays. Chong AK, Tan DMK. Diagnostic imaging of the hand and wrist. In: Neligan PC, ed. Plastic Surgery. 3rd ed. Philadelphia, PA: Elsevier Saunders; 2013:chap 3.